Heat oven to 450°. Spray large cookie sheet with cooking spray. Stir Bisquick mix and water until soft dough forms. Divide dough into fourths. Pat each part of dough into 6-inch circle on cookie sheet, using fingers dusted with Bisquick mix; pinch edge to form 1/2-inch rim. Spread Alfredo sauce on dough. Top with chicken, mushrooms and chopped basil. Sprinkle with cheese. Bake 9 to 11 minutes or until crusts are golden brown and cheese is bubbly. Garnish with additional basil leaves. 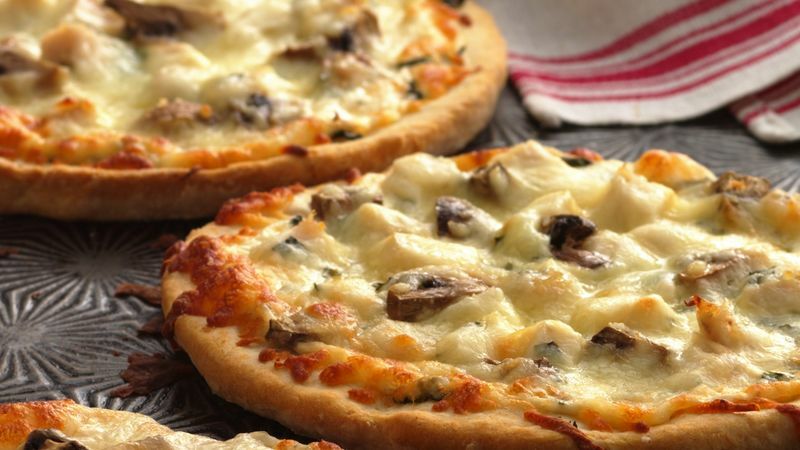 Using boiling water makes the pizza dough more chewy and flavorful. Keep it to one step by measuring 1/3 cup water in a small glass measuring cup and microwaving on High until full bubbles appear.